We are a group of local folks working to create a new housing alternative in Iowa City. We are building a neighborhood based on the "cohousing" model which started in Denmark and has now spread worldwide. There are hundreds of cohousing communities in the U.S, Canada, Australia, Sweden, New Zealand, the Netherlands, Germany, France, Belgium, Austria and elsewhere. The next one is currently springing to life right here in Iowa City! We started meeting in 2009 to explore alternatives to traditional housing arrangements. We all share an interest in living in a community that reflects our values. We want a living arrangement that will allow us to reap the benefits of community life and still retain our privacy. Our community will include 36 eco-friendly residences clustered around a shared pedestrian-only green space within a short walk of community gardens and orchards. Each household will have a private kitchen as well as access to shared facilities in a "common house" with a large kitchen and dining area where we can cook together and share meals several times a week. The common house will include guest rooms as well as meeting spaces, a playroom for kids, and shared work spaces where we can swap tools and talents. Get the inside story on our blog. Read the latest news stories about the project. Our community, which we've christened Prairie Hill, is currently under construction. It's situated on 7.8 acres of land on Miller Avenue, just south of Benton Hill Park on the west side of the river. We're just a mile and a half from downtown Iowa City, within walking/biking distance to campus. We're close to a grocery store, restaurants, and city and university bus stops. You can watch the building progress on our Facebook page. View from our hilltop community garden looking down toward Miller Avenue. The red building in the foreground is one of the stacked flats. The building with the bright red roof further down the hill is the common house. Together with the architect, the engineer, and Iowa City staff, we have developed a site plan which shows the configuration of the homes as well as the placement of the common house, parking, orchards, and community gardens. See the site plans (PDF format). Our architect, John Shaw, has designed a spectacular common house which includes a large dining room and kitchen, shared work spaces, and four studio apartments. He has also designed individual homes which will nestle into our hillside. Homes will vary in size from 645-1600 square feet. There will be a combination of two-story duplex units, attached one-level townhomes, and what we're calling "stacked flats." The stacked flats are fourplexes with two units on the upper level, and two on the lower level. See the elevations and floorplans. 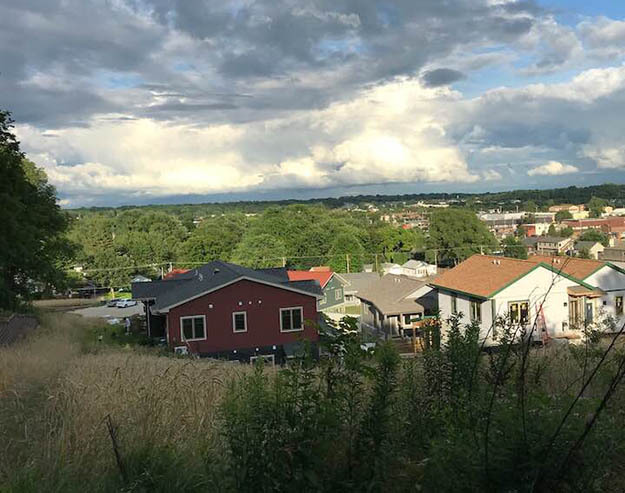 Ten households are currently living in Prairie Hill—three in the stacked flats at the top of the hill, four in the apartments on the second floor of the common house, and three in the townhouses. Other folks will be moving in soon. So things are happening quickly, but we still have room for you. It's not too late to have a say in the design of your dream dwelling spot. If this sounds interesting to you, we would love to have you join us to learn more. We are seeking people who share our enthusiasm for sustainable multi-generational community living. Here's a link to information on how to get involved.